Once again, I am horrible at updating. Sorry to those who have been wondering how we are doing and if Ally is home. The VERY good news is that she came home Monday, July 6th after her 13 day hospital stay with H1N1 virus (swine flu). She proved once again what a strong fighter she is and that she has a lot more to do here on earth. I am soooooooooo proud of her and so thankful to God! I am also thankful to the hospital staff, family and friends for all your help and support. A special thanks to my MOMS Club who made several delicious meals to make the last two weeks a little easier for me. We have been SUPER busy catching up on life and having some summer FUN! I have tons of pictures and good stories to share (very soon), but thought I better at least let everyone know Ally is home and doing VERY well. She had one week of homebound summer school and last week attended Stock School! Next week is the last week of summer school and although there are risks of going, it is so wonderful for Ally. We have been to church a few times, I’ve visited the hospital twice to see the other two SMA families and offer a little support, Kristyn celebrated her 13th Birthday at the North Avenue Beach with 14 teenagers, and soooooooo much more. I will try super hard to update more and share pictures soon. Some more good news — We will be celebrating Ally’s 3 1/2 year old Birthday with a Birthday-Fundraiser Party on Sunday, August 2nd from 1-5 pm at Aloft Hotel in Rosemont. Since we are unable to celebrate Ally’s birthdays in February due to the cold and illnesses, we have decided we will celebrate Ally’s life and accomplishments every August. 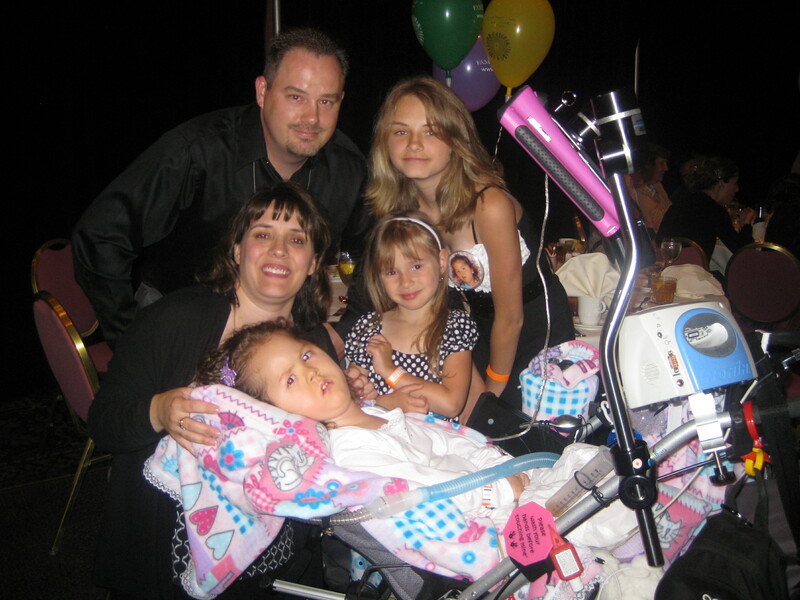 August is also SMA Awareness month. It’s also a special time to come together with family and friends as a special “thank you” for all your support. I’m hoping some of Ally’s therapists, teachers, nurses, maybe even doctors might be able to stop by and see her during this happy time. I’d love for family and friends to be able to meet you. Attached (if you are reading this in email form) is an invite and donation form (in case you know any businesses that might be interested). The invite is also posted as an additional page on Ally’s website. Email me if you’d like PDF copies. I hope to mail some today or tomorrow too. I apologize for the short notice. Hope to maybe see many of you soon. 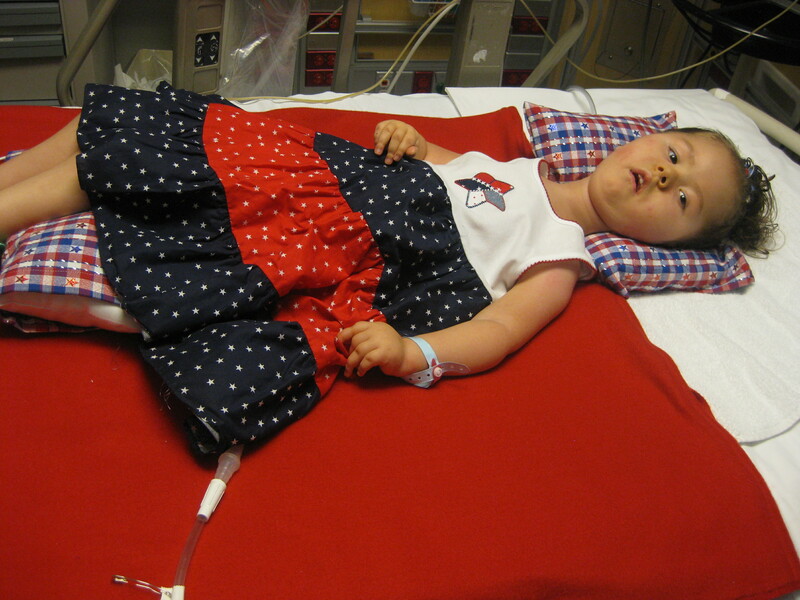 Ally ready for 4th of July - breathing again on her own!!! Super, Super, Super GREAT NEWS!!! 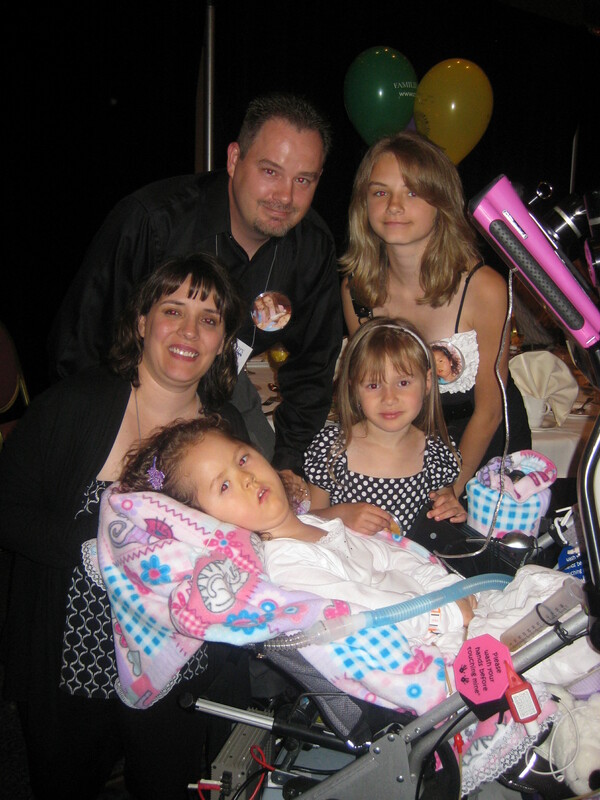 Ally was extubated (had her breathing tube taken out) on Friday 7-3-09 at 2 pm. She is doing absolutely WONDERFUL!!!! So we are truly CELEBRATING this success and the 4th of July at the hospital. I am also continuing my prayers and thanks to our AMAZING God!!!! IF – things continue to go this well, my new goal is to wean bi-pap settings and treatments and go home in 2-4 days, all depending on my little Angel Allyson (and how well the docs agree with me). She was put on bi-pap immediately after the breathing tube came out (to be extra cautious since the docs were super careful/cautious with higher settings 22/8 and some oxygen at first 35%), and continued with her treatments every 2 hours. By 8 pm, her food was restarted since the docs on wanted her off her food way longer than I was comfortable with (Ended up 16 hours from start 4 am to finish 8 pm off food since they were worried that her tummy needed to be empty if the breathing tube needed to go back in. 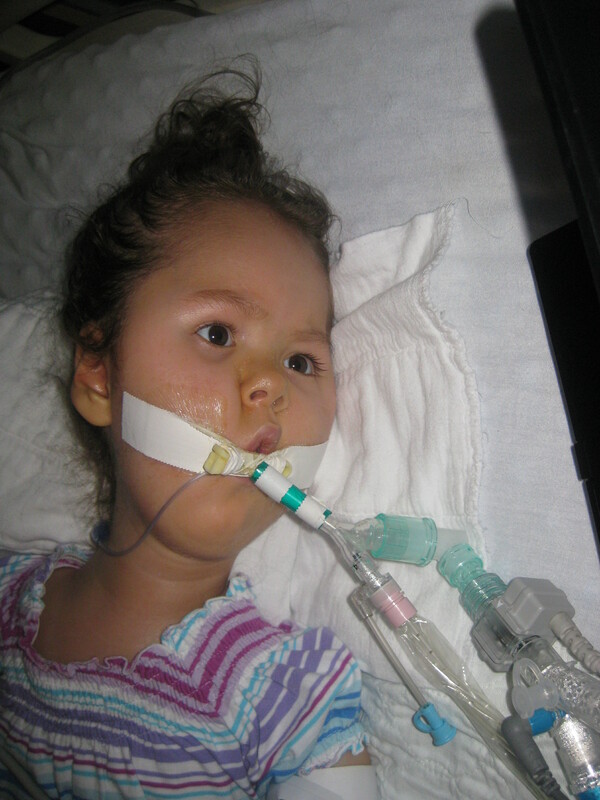 She did have TPN -Total Parental Nutrition thru her IV to give her something , but I don’t know if it was the right ingredients for Ally with SMA on an amino acid diet and not able to tolerate high protein or fats. I was soooo worried that without her food for more than 4 hours she wouldn’t have enough energy to breath with just her bi-pap and might crash before they started her food. In the past, we only stopped her food for about 2-4 hours total since she is fed into her jejunum at a slow rate of 50 cc/hr when in the hospital.) But all ended up okay. 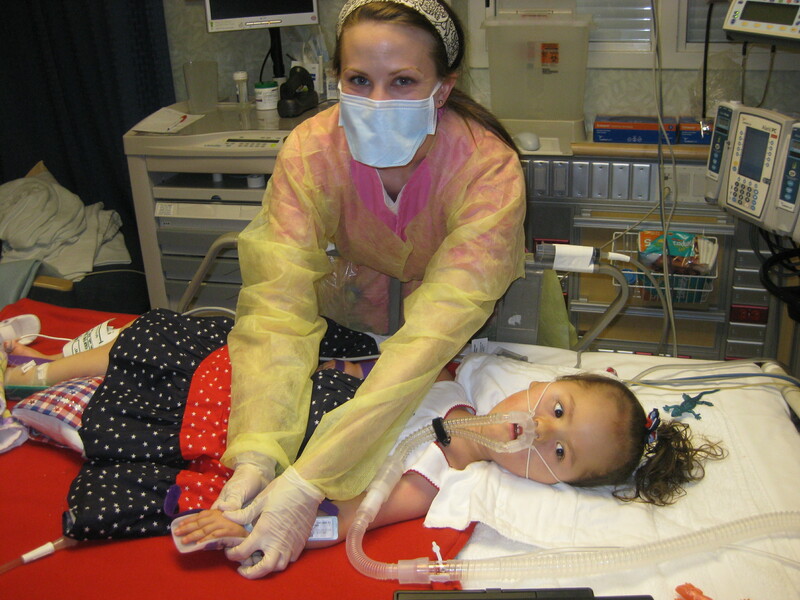 She started her regular food at her regular rate at 8 pm into her j tube. Oxygen was weaned to room air by 10 pm!!!! A special thanks to the hospital staff and Dr. Rosenfeld for talking and working well with me to make these additional changes in the evening and establish a new, better working relationship of willing to try things a little different than the ‘norm’. Also a HUGE thanks to our absolute favorite respiratory therapist Loretta for a smooth transition of breathing treatments! Late this evening, Ally got a really good bed-bath with a great hair washing at 11 pm. Ally was able to be off her bi-pap for about 40 minutes for the bath with NO de-sats (breathing trouble) at all. Super RN Sarah and I got her all cleaned up and dressed into her new 4th of July dress. We changed all of her bed linens and set up her AMAZING new holiday pillows and blanket from Grandma Carol. PLEASE see the pictures below. So now my goals are — wean bi-pap setttings to 18/6, tolerate treatments every 4 hours or less often, xopenex every 4 hours or way less, more mini-bipap breathing machine breaks (like she did during her bath), re-do blood work to check her white blood cell count to see if we will re-start her hydroxyurea, MAYBE try out using a vent non-invasively instead of a bi-pap machine, update her PICU Plan of Care some more, share concerns and praises with the hospital staff/administration, visit 11 month old Mariah who has SMA 1 and just got her trach last week, and get the heck HOME. So hopefully, my next post will be from HOME (maybe Sunday/Monday or Wednesday the latest). Ally will let us know when she is safely ready. Prayers for things to go smoothly with the hospital staff and her continued recovery. I am very hopeful that she will be completely at her baseline very soon and we can safely continue on with a FUN-Filled Summer staying away from crazy, insane germs. My little girl is just sooooooo AMAZING, brave, inspiring….. wonderful!!! She teaches me and others so much. I am also so thankful to the hospital staff and our Wonderful God! Another special thanks to all of our friends and family for your well wishes and prayers. The power of prayer does work! Hope you all have a GREAT 4th of July Weekend! Look at my cool pillows and blanket from Grandma Carol! 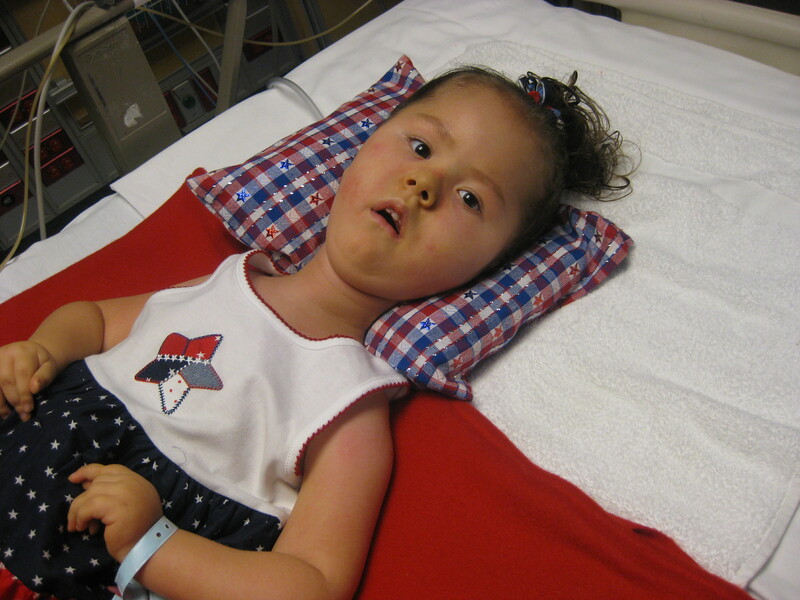 Ally ready for 4th of July – breathing again on her own!!! This update will be emailed and posted online, but be sure to sign up for Ally’s blog updates at www.AngelAlly.com which I will try to update more often. Just an update to let everyone know that Ally is slowly, but steadily making progress, but we are still here at Children’s Memorial. 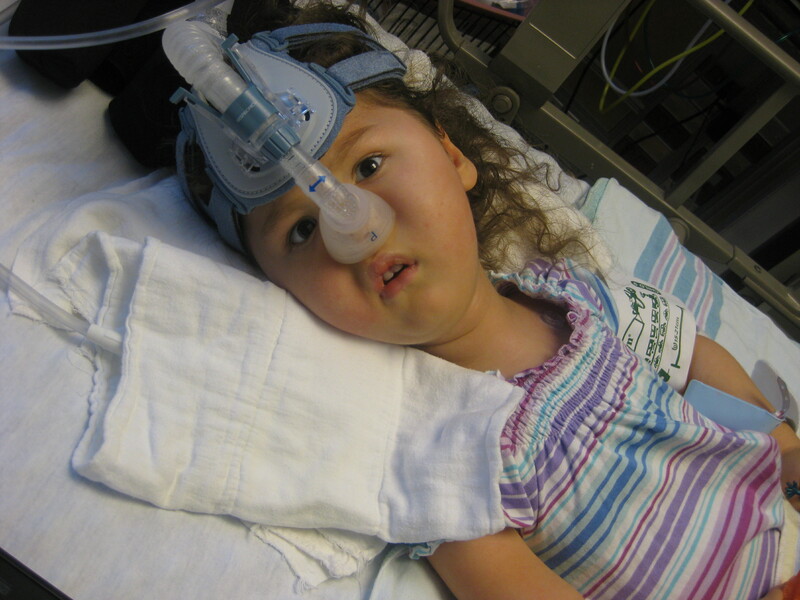 A few days ago, I posted on her www.AngelAlly.com website that she had to get a breathing tube last Friday because of a huge plug that blocked her airway. Her lungs are much clearer, secretions are thinner, fevers are gone, antibiotics and Tamiflu are finished, no more supplemental o2 thru the vent, and we are just working towards even clearer lungs and lowering vent settings so we can take the breathing tube out and switch to her bi-pap breathing machine, and then hopefully wean that again. We went down on her treatments on Tuesday and had a little set back in her x-ray, so we went back up today to every two hours with IPV every time and vest every 4 hours. My “hopes” is that within a couple of days we will be able to take the tube out, then a few more days of recovering and then home. Ally will lead the way though. We are always nervous of how well Ally will do after the breathing tube has supported her so much, but I have high hopes she will be strong enough to do it once the bug is completely gone. She was doing soooooooooo well before this H1N1 virus (which was officially confirmed today), and I have faith that we will be able to go back to our normal routine and fun activities. Ally has been very alert and overall happy watching her cartoons and movies. She doesn’t get a ton of continual rest due to the treatments and doesn’t like when the tube moves around, but she is overall doing well. “Slow and steady wins the race.” Ally continues to amaze me everyday. Thank you again for the emails, posts, phone calls, cards, prayers and well wishes. I am sorry that I haven’t been able to talk much on the phone or email anyone directly. This stay has been a bit rougher emotionally. I’ve only left the room once to go home and shower quickly and then just bathroom breaks. I have slept quite a bit since things are going overall well with the hospital staff (although we are still having lots of new nurses and some less familiar respiratory therapists – but everyone is doing their best for Ally and I am very thankful). I also don’t want to spread any bugs and want to be at Ally’s side if she needs me. Billy visits every day and him and my mom are doing wonderful with Kristyn and Melissa. I do miss them greatly though. The girls will be going this weekend to my sister Sandi’s in Fox Lake to celebrate the 4th of July. So that’s about it. Just slow and steady progress, and lots of prayers.